Norbu Wangchuk holds a Bachelor degree in political science honors and a Master degree in history and political science. 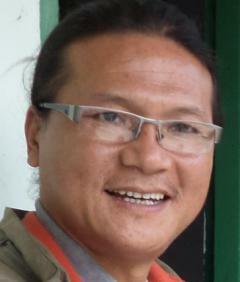 1995-1997 he worked as a history and political science teacher to the senior students of TCV School. 1997-1998: Freelance translator Tibetan to English and vice-versa covering subjects on politics, history, biographies and dharma. 1998-2001: Got selected through exam for Assistant to Prof. Samdhong Rinpoche. Travelled with Rinpoche in India. 2001-2006: General Secretary of Songtsen Library. 2006 - : General Secretary of Tarab Ling working as administrator, looking after day to day maintenance of Tarab Ling, making relations with different organizations, organizing UD courses, translating UD for Tibetans, keeping the accounts and Foreign Contribution Regulation Act (FCRA) of Tarab Ling updated.